A social network group calling itself “Yelk” (exit or way out) has initiated a petition seeking the return of Vano Siradeghyan, the former Minister of Internal Affairs and mayor of Yerevan who has been wanted by authorities for 12 years in for his alleged involvement in crime. A number of politicians and intellectuals have joined the initiative calling for “the sake of greatly talented writer and state figure Vano Siradeghyan’s right to live in his motherland”. This week the Free Democrats party board has decided to also sign the petition. “We are calling upon those citizens of the Republic of Armenia, who care for the human rights and victory of justice in our country, to support this initiative,” Free Democrats said in their statement. 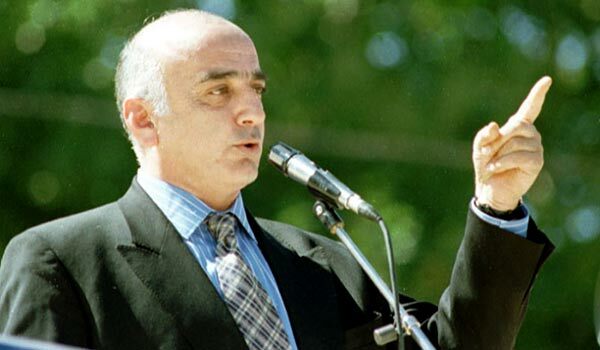 In 1998, a criminal case was filed against Siradeghyan (Karabakh Committee member since 1988, president of All-Armenian Movement from 1997 to 2000, and member of parliament from 1996 to1999), for organizing a number of planned murders. In 2000, the parliament stripped Siradeghyan of his diplomatic immunity and then of his parliamentary mandate. The same year (2000) he fled from Armenia and has been wanted by international intelligence (Interpol) ever since. Siradeghyan has been charged with almost a dozen articles of the Criminal Code. Among other things, he is accused of forming an armed criminal grouping (the “Armen Ter-Sahakyan’s gang”) during his tenure as Minister of Internal Affairs, in the summer of 1992; of armed assault and of assassination of individual citizens and officials. He is allegedly the one who ordered the murder of Hovhannes Sukyasyan, chairman of Ashtarak regional council’s executive committee; the one who organized the murder of Hambardzum Gandilyan, head of administration of Armenian Railways, his driver Hakob Unikyan and passenger Zhora Isahakyan. Siradeghyan is also accused of preparing and organizing the assassination attempt against Artur Hakobyan, who was the head of RA prosecution’s criminal investigation department. The parliament is scheduled to discuss an amnesty project by the end of July; justice minister Hrayr Tovmasyan says the text has been prepared by employees of the ministry and the presidential staff. An opinion is circulated in the press that amnesty would also apply to Siradeghyan, if he comes back to Armenia before then. Parliament speaker Hovik Abrahamyan says he has no such information. “I’m not expecting him; if he wants to come back, let him come, it’s his business,” says the country’s chief lawmaker. Heritage party member, political analyst Stepan Safaryan told ArmeniaNow that all this indicates a decision made on the highest level to allow Siradeghyan’s return to Armenia. “He left Armenia during Robert Kocharyan’s presidency. If during the current president’s tenure Siradeghyan is allowed to come back and his wrongdoings can fall under amnesty, it means that the current president himself has made a decision to drop the prosecution,” says Safaryan. In his interview to Hayeli.am Ashot Bleyan, who signed the petition, headmaster of Mkhitar Sebastatsi educational center, former education and science minister, said that Siradeghyan’s return represents a political solution, because the political leadership has to have courage to take that risk. “It also requires public consent. If Vano has to answer in law, he has to answer to the Armenian society, has to answer to me. I can ask him questions. And that has to be done in public, and Vano will find a way to do so. Estranging Vano means being afraid of him,” says Bleyan. Political analyst Yervand Bozoyan, in charge of Mitk (“thought”) analytical center, told ArmeniaNow that if Siradeghyan had made a statement himself, it’d be easier to comment on the issue. Writer Sergey Galoyan believes that today Armenia needs Vano Siradeghyan – “one of the best modern writers, a charismatic figure”. “In the ‘90s Siradeghyan did in Armenia what Benito Mussolini did in 1923, that is, he ‘uprooted mobsters,’ he said, claiming that six months ago Siradeghyan’s criminal case disappeared during transfer from one court to another. In this connection RA Judicial department spokesperson Arsen Babyan told media representatives that Siradeghyan’s case is in the judicial department’s archive.